REVIEW – Music in a cylinder. Ten years ago, no one thought of having a complete music system in a handheld unit about the size of a 24-ounce can of malt liquor or a sleeve of tennis balls. Yet, on sites like ours, there are dozens of these cylinders that vie for the attention of the masses of music-needing folks. Last Summer, I brought you the little brother to the unit under review today. The one we’re looking at today is slimmer, taller, and has a few more features, along with an upgraded moniker. 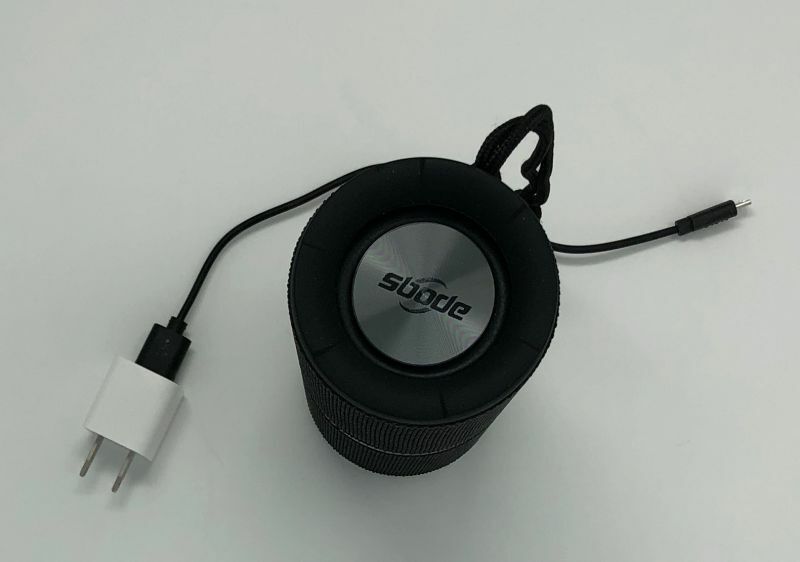 Meet the Sbode M400 Multi-Function Bluetooth Speaker. Note: Photos may be tapped or clicked for a larger image. 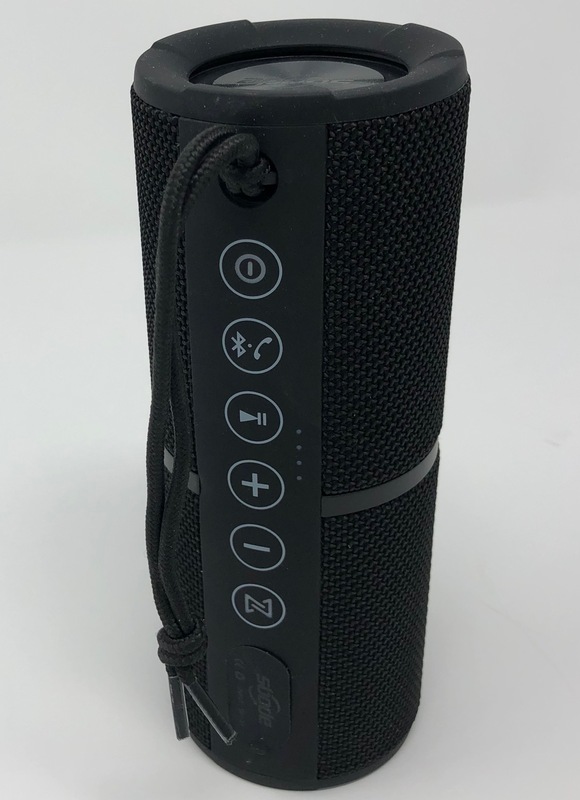 The Sbode M400 is a music playing cylinder that offers IPX-6 weather resistance, networking with another device of the same model for stereo pairing, just about any source for sound, and 8 hours of non-stop music from the 2200mAh battery. 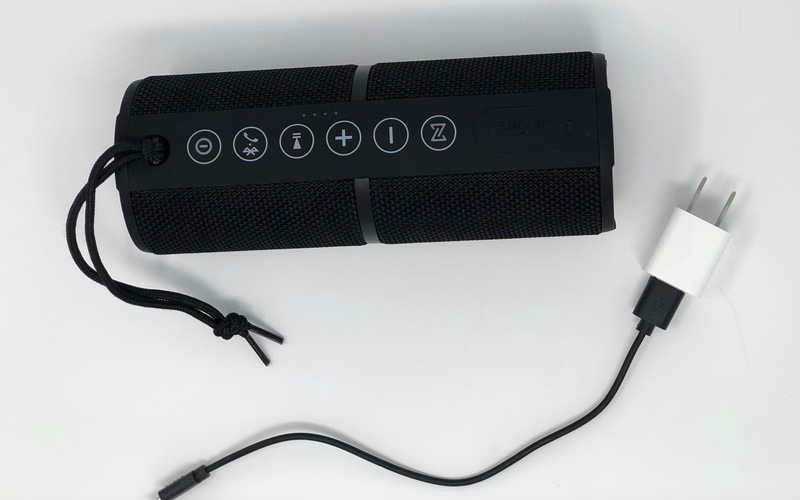 The box contains the cylinder, with a nylon cord attached, a charging cable (USB A/3 to microUSB), and an eighth-inch stereo plug that will work with your headphones or any device you still have around that connects with this method. 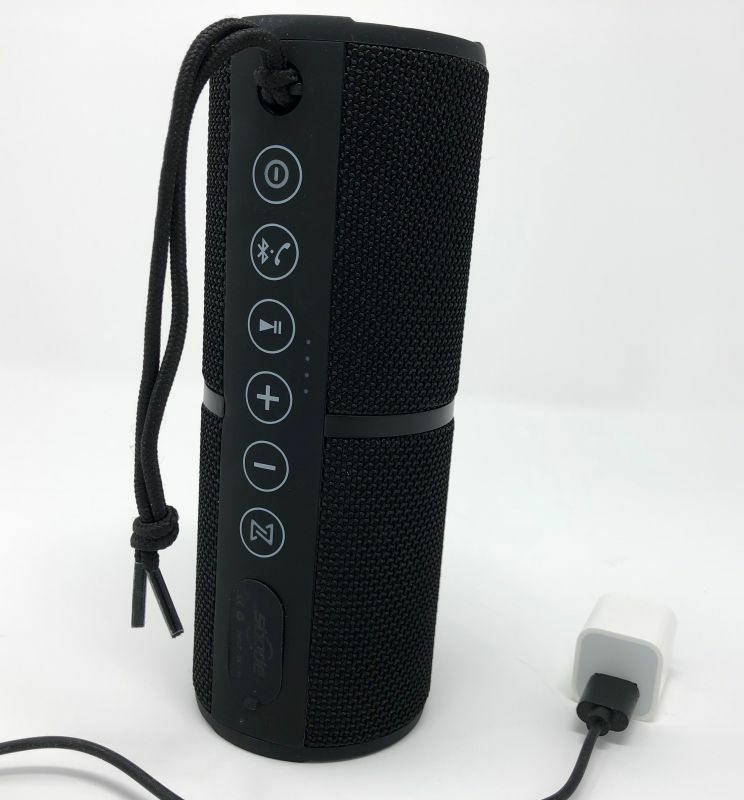 The buttons provide control over power/speakerphone access, playback mode (more on this later), play/pause for TFF-card playback, and volume up/down buttons. The final button is for syncing two devices together. According to the instructions, this is almost instantaneous, but I was not able to test, having only one unit. The Sbode m400 is a very affordable, good-sounding music player. 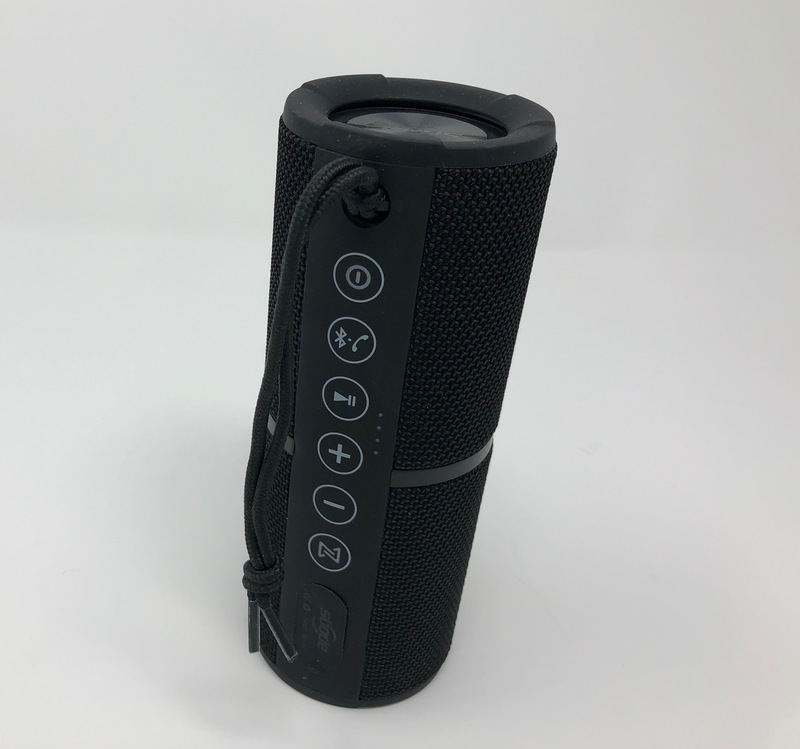 It’s not one of those top-of-the-line, blow-off-the-ceiling-with-no-distortion systems that will make your block parties invite police visits, but it’s perfect for a dozen friends at the beach, on a deck, or camping. If you want even better stereo, apparently you can sync it with another identical system, but this was not tested. (This feature was not tested, as I was only sent one unit.) At $80 ($40 each), it’s way cheaper than $350 for an Apple HomePod or even $200 for a Sonos One. I tested mine mainly with my iPhone 8 Plus around my house. I could easily clear a room with Joe Cocker’s She Came In Through the Bathroom Window or even something like Crazy Train from Ozzy. I never had the volume up fully, either. The various input modes, accessed via a semi-long press of the power button (a long press turns the unit off) rotate through Bluetooth, FM Radio, AUX-in, and TF card playback. The FM mode is supposed to automatically tune into a station, but there is no volume control. So, you get this loud static, and the plus-minus keys just cycle through other pre-set stations. It’s horrid. I think there is firmware out there that could automatically sense which device is actively playing, rather than having to manually hold the button in just a touch less than what will turn it off. I wound up using it exclusively with Bluetooth and never missed the other input modes. Once I entered the initial full charge, I rarely paid attention to the four LEDs that indicate power when you power it on. Once it got down to only one LED, I noticed the Bluetooth connection with my iPhone would seem weaker, but it seemed to last forever. Decent sound, exceptional at the price point. The FM mode is useless. Having to switch input modes is kinda fiddly. Speakers of this type are everywhere. This unit sounds very good, but there are those that cost more that sound a bit better. If you want something to toss in your camping gear or just to sit on your screen porch, this could be the one. No reason not to recommend it, but I don’t see any reason not to use the one you have, or to buy a better brand if you want audiophile sound. For background and on-the-go, however, this is fine. And for the price, getting two and using linked may be a huge boon to your listening experience. Source: The sample of this product was provided by Sbode. A gadget nerd from childhood, Smythe has always been drawn to solving everyday problems with clever tools. An Apple fan since his Mac Plus in 1987, he's sure the company will one day do great things, despite being perpetually doomed by their competition.